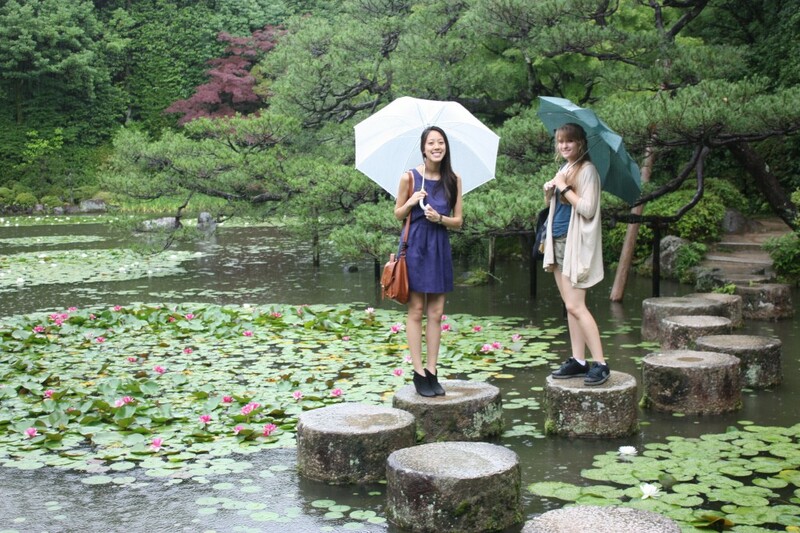 Our first full day in Kyoto was packed with activities. Unfortunately, a typhoon was forecast to hit us on this day as well. We woke up to a rainy morning, but nothing too heavy. 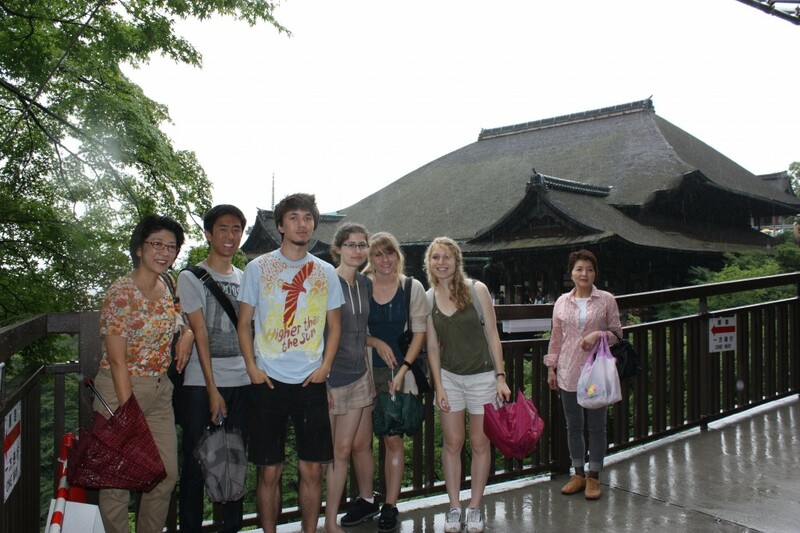 We all boarded our tour “coach” (bus) with rain gear in hand and headed to our first destination, Kiyomizu Temple. When we arrived at this Buddhist temple, the rain started to really come down. This was a good thing in this situation, though, because at this temple there is a famous fountain that supposedly has ability to extend the life of people who drink from it. Morgan and I decided partake in this local tradition and drank from the fountain. It was very cold and refreshing. 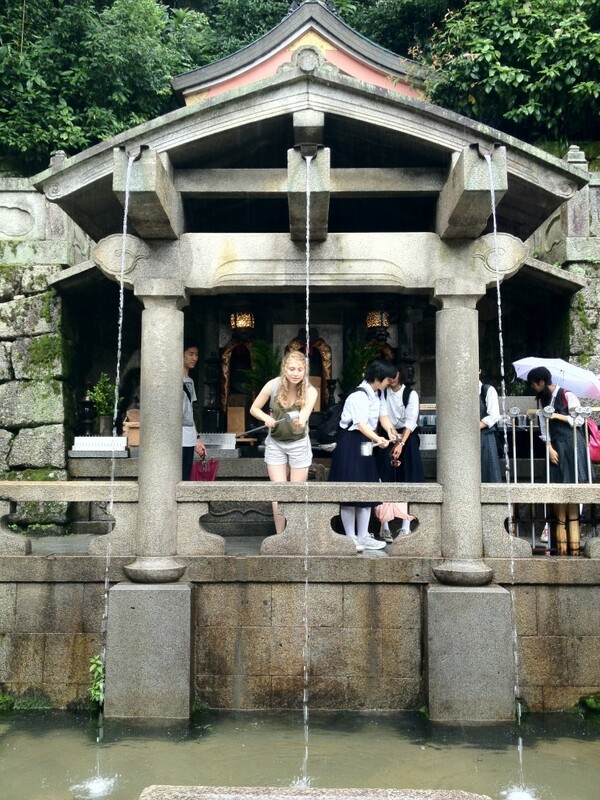 The water for the fountain is sourced from the mountain on which Kiyomizu Temple is located. Something I thought was really amazing is that the ladles for the fountain weren’t the usual wooden ones we’ve seen around other temples and shrines in Japan, but made of metal and stored in a box with a UV light to kill any bacteria on the ladle. Another interesting thing about Kiyomizu Temple is that there is a sloped stage at the front of it, from which a Japanese saying has been derived: “to jump off the stage at Kiyomizu.” This is equivalent to the English saying “taking the plunge.” There have been instances where people actually would jump off this stage into the forest area below. Surprisingly, a high percentage of these people survived the plunge. Our next stop on Typhoon Tuesday was Nanzenji Temple. 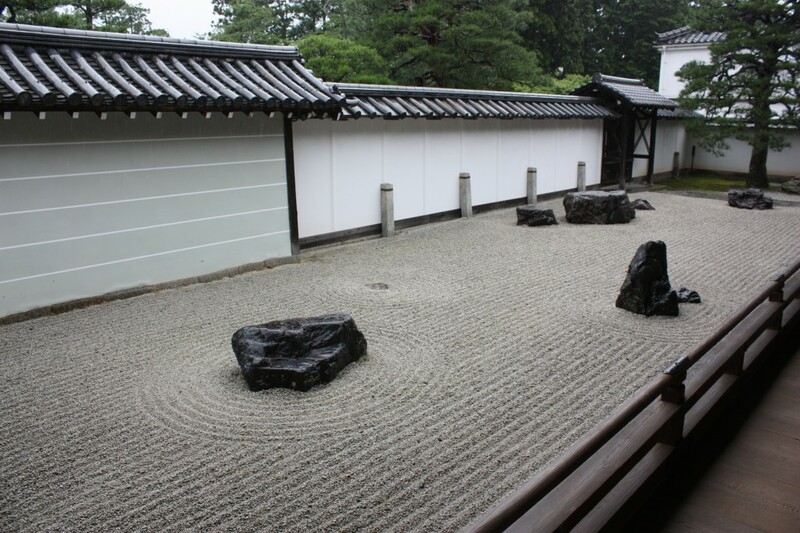 At this temple, there is a really nice and peaceful Zen rock garden. Even though the rain was coming down harder than earlier in the day, we all enjoyed this temple and its serenity. 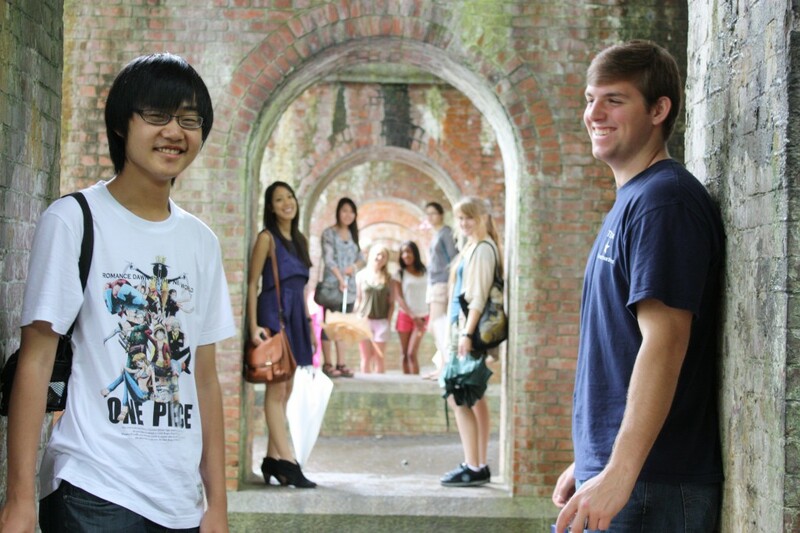 There was also a nice arch structure that a few of us took pictures around. Next on our rainy adventure through Kyoto was Heian Shrine. This shrine has a really beautiful Japanese garden behind it, and though the weather started to get even worse when we visited with the wind picking up, it was too nice of a place to pass up taking a few pictures. Japanese gardens are really something everyone should experience. 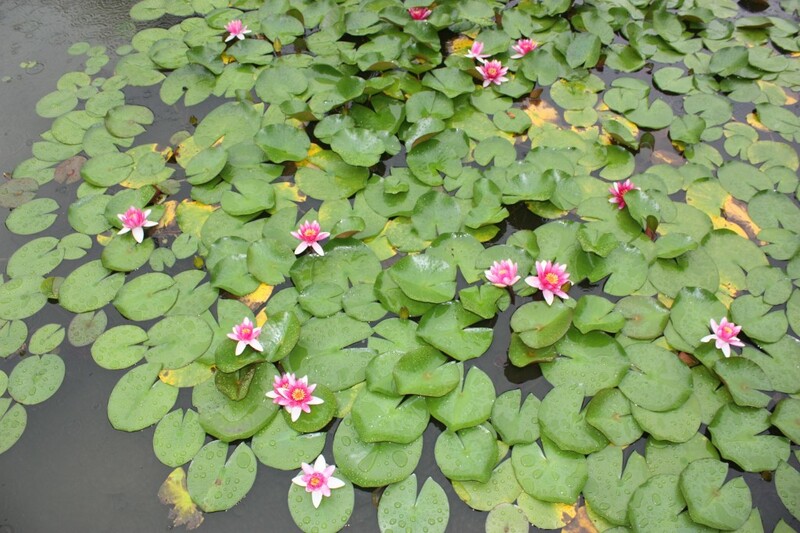 I say “experience” because the way they are designed, you really need to walk through the garden to fully appreciate them. 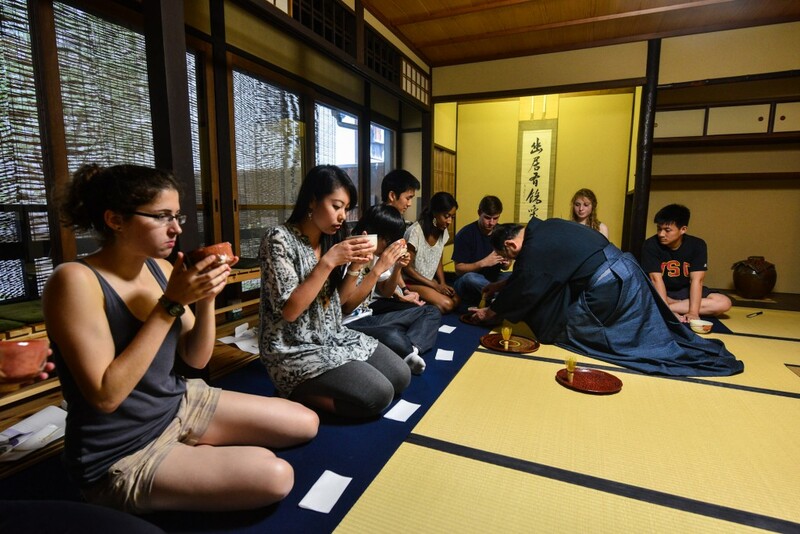 Our last stop on this busy day was a traditional tea ceremony. 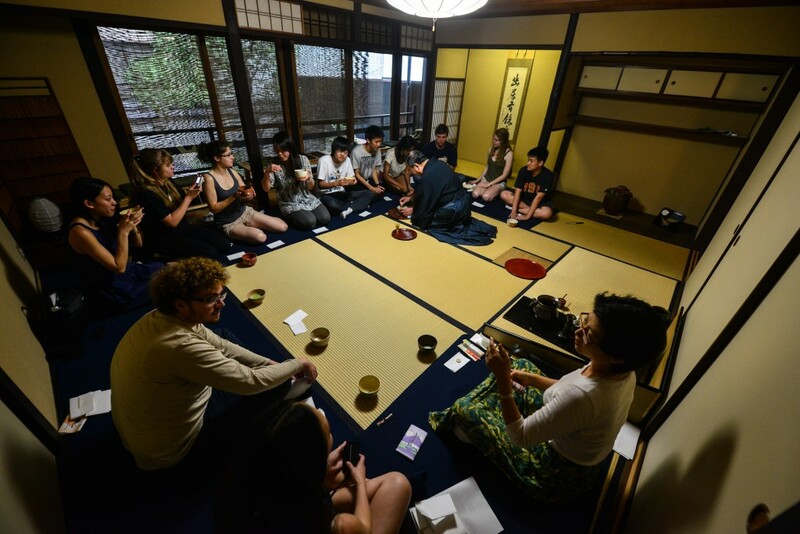 Here we learned about the multiple and complex aspects behind a traditional Japanese tea ceremony and had the opportunity to enjoy matcha green tea, which many people in our group go crazy for. Drinking our tea in a traditional Japanese tea ceremony.